Seroquel is brand name for the generic drug Quetiapine and is a second generation atypical antipsychotic medication produced by AztraZeneca. This drug is able to lessen or block brain chemicals like serotonin and dopamine. It can be used to treat both schizophrenia and bipolar disorder by altering the brain’s chemistry. Seroquel (quetiapine) should only be used for bipolar patients who are 10 years of age or older and schizophrenia patients who are over the age of 13. Extended-release Seoquel XR is intended for adults over the age 18. Dosage for Seroquel varies based on the individual’s needs. In general, Seroquel for schizophrenia begins at a dose of 25 mg and is gradually increased to 800 mg. For bipolar disorder, dosage begins at 50 mg and increases gradually to 300 or 400 mg. The doctor and patient work very closely in determining the most effect dose. Seroquel is administered in a pill form and can be used to treat children as young as 10 years old. In a low dose it acts as an antihistamine. If the does is increased the Seroquel begins to block the serotonin receptors. At an even higher dose it begins to block the dopamine receptors. AztraZeneca has also come out with an extended release form of Seroquel called Seroquel XR. Physicians can prescribe varying doses of Seroquel to find the right amount for each patient. If a patient is taken off of Seroquel, it is recommended to gradually reduce the dose. Seroquel can cause some very uncomfortable withdrawal symptoms. Seroquel is used to treat bipolar disorder and schizophrenia in teens and adults. It is not designed to cure these disorders, but rather to help manage the symptoms. There has been some debate on whether typical antipsychotics are better than atypical antipsychotics like Seroquel for patients with Schizophrenia. Regardless, it is commonly prescribed to help regulate the chemicals in the brain. In patients with bipolar disorder, Seroquel is used for acute manic episodes and depressive episodes. It is commonly used in combination with lithium, valproate or divalproex. It can also be used to treat post-traumatic stress disorder, alcoholism, borderline personality disorder or depression. In some cases it can be used as a sedative for those with anxiety or sleep disorders. Seroquel should be used in conjunction with talk therapy and other antidepressant medications for the best results. The use of Seroquel (quetiapine) is highly personalized to meet the specific needs of the individual. Seroquel is meant to regulate the chemicals in the brain by keeping dopamine, serotonin and adrenergic in the brain longer. It does this by bonding to the receptors of dopamine, serotonin and adrenergic; and, as the brain releases these chemicals, the Seroquel blocks the receptors. These are chemicals naturally produced by the brain that help monitor the body’s emotions and cycles. It is the imbalance of these chemicals that is thought to cause most mental illnesses and so by blocking a portion of the receptors, the brain chemistry can even out. By bonding with the receptors, the Seroquel can help the brain function in a healthy way. 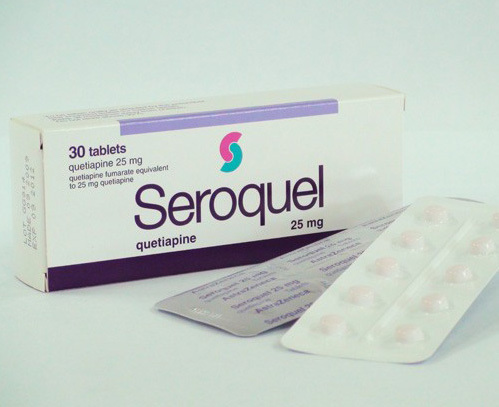 Seroquel is not meant to treat conditions related to dementia. Older patients with dementia related conditions may experience heart failure, sudden death or pneumonia. Before starting Seroquel patients should speak with their doctor about their past and current conditions. Patients should especially be concerned with seizures, cataracts, a family history of diabetes, a thyroid disorder, or liver or kidney disease. Seroquel can have negative effects in patients with any of these conditions. The prescribing physician should also be aware of any past suicide attempts or suicidal thoughts for the safety of the patient.